Why Support Small Businesses? It’s More Than the Economy! 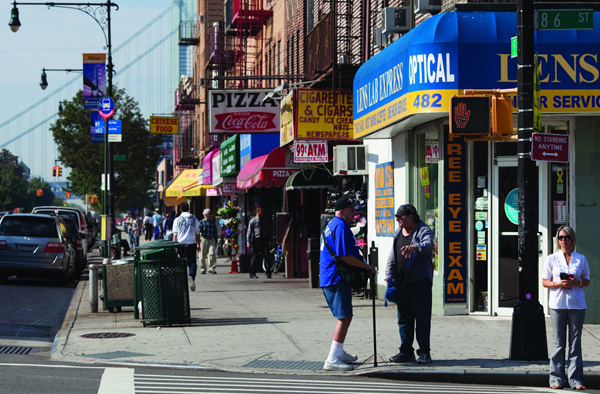 The 86th street thoroughfare in Bay Ridge has been a bastion of small business activity in Brooklyn for decades. 1. It helps the economy: I had to start here, because it’s the prevailing rationale, and a valid one at that. Small businesses make up between seventy and eighty percent of establishments and provide almost forty percent of the jobs in the U.S. By shopping in their stores or by buying their products, you are obviously supporting them. For a whole slew of reasons, their successes mean good things for the nation’s economy and, in turn, your own prospects. However, the success of this argument very much relies on the benevolence of shoppers—that they are shopping local to support some greater notion of economic growth and prosperity. And this can work for some, especially on one day out of the entire year, but it still seems rather disconnected as an ongoing strategy. 2. It supports entrepreneurship: Small and local businesses are synonymous with innovation, creativity and the nimbleness of independent ownership. The stories of entrepreneurial struggle and success can provide inspiration for local purchases, and highlight accomplishments in developing one-of-a-kind products. What they also do, however, is glamorize the narrative around small business ownership and make exceptional a feat that is not only very challenging (sometimes prohibitively so), but is also as simple as operating a shoe repair or bagel shop. Know that you can support entrepreneurship by shopping at the local hardware store too. 3. It furthers diversity: What many people maybe don’t know is that business ownership and formation rates are higher among immigrants than non-immigrants. Turns out, then, that small, local businesses are an important pathway for employment, asset-building and overall livelihood for a growing part of our population. The growing probability of a consumer, or his or her relative, being an immigrant (25 percent and growing, based on population shares) alone increases the chances that this argument will resonate more profoundly. 4. It leads to other good things for the community: Communities with more small, local businesses can actually be safer, more resilient places. Commercial establishments, especially those run by people familiar with or tied to the community, can create a presence on the streetscape where lights are on and eyes are outward. But, as Jane Jacobs notoriously asserted: “You can’t make people use streets they have no reason to use. You can’t make people watch streets they do not want to watch.” We need those businesses, and we need people patronizing them. More local businesses can also stabilize communities, since they can diversify the economic base and will more likely make operational decisions (i.e. hiring, relocating) with the interests of nearby residents and consumers in mind. This also means less vulnerability in the face of distant economic shocks (i.e. China). 5. It can actually save our communities: Every holiday season I walk through New York City’s Union Square Holiday Market, a cluster of over 200 independent vendors that rent out 180 kiosks to sell their goods. I love this experience for two main reasons. First, the very rational part of my brain relishes the efficient shopping—I can find something for everyone in one place. The convenience makes the experience enjoyable and fulfilling and, honestly, one that I wish I could achieve within walking distance of my home. However, more and more, what I pass on the streets, in my neighborhood or nearby, are vacant, empty storefronts; or businesses that are open, but empty nonetheless. This brings me to the second reason why I love my holiday market shopping trip—because I am not the only one there. The aisles are packed with other people similarly searching for that perfect gift, or that one-of-a-kind item that they can’t find at Target. The experience is visceral, sensory, one where people can feel and smell the products and even meet the person who made them. Maybe you even back into another customer in the kiosk next to you or for the first time notice a necklace, not on the shelf, but in the hands of another customer. It turns out to be a social, extroverted experience rather than a very isolating or dispassionate one. The unfortunate part is that this campaign is once a year, one small part of an onslaught of other tactics to induce consumer-spending. The reality is that this push needs to happen more often, for it to generate a cultural, systematic shift, rather than a blip on the consumer spending trend lines. The second irony (see the beginning of this post for the first one) is that American Express is perhaps doing more for our small businesses than even the government, which reportedly gives out more incentive awards to big businesses and leaves small businesses with little to no insurance to protect their livelihoods under unexpected and sustained business interruptions. Certainly, we need to think about public interventions to help small businesses form and thrive, especially in places where the costs of operation are highest. However, those solutions take time and political will. The reality is that while small businesses need us, we need to start realizing that we are just as reliant on them. Perhaps this can be motivation enough to shop small all year long. Rachel Meltzer is an assistant professor of urban policy at the Milano School at The New School in New York City. She Tweets @ProfRachelM. deBlasio is in the process of destroying NYC small businesses with the $15/hour ($31200/year) minimum wage, mandatory sick days, and increased property and water taxes.